The final COST meeting is still to come but so far this action has organised three very successful training schools (Grenoble, FR; Namur, BE; Bangor, UK) and four scientific meetings (Berne, CH; Birmingham, UK; Prague, CZ; Siena, IT). COST CM 1102 is coming to its end! The last COST action CM1102 meeting will be held in Antalya/Turkey. The meeting will be hosted by Mustafa O. Guler. Airport: Antalya International Airport (http://www.aytport.com/en/index_1.asp) has regular direct flights from several European cities. You may also connect through Istanbul. Airport to Hotel Limo service: Advance reservation is required. (https://www.securedrivetravel.com.tr/Reservation.aspx) The cost is 43 TL (about 15 EUR). 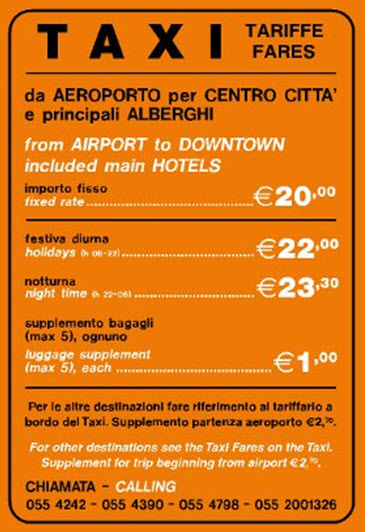 Hotel to Airport: Taxi from airport to hotel is around 20 EUR. Hotel: The accommodations are booked in the Roxos Downtown Antalya Hotel. The negotiated rates include all meals, the conference venue and the gala dinner. You are recommended to use hotel facilities and the beach on Wednesday (Oct 28) and Saturday (Oct 30) because you will spend most of your Thursday and Friday for the meeting. The hotel has a private beach, and there is a shuttle running in front of the hotel. Visa information: You may obtain visa for entrance to Turkey through online or through local consulate. The e-Visa is an alternative to visas issued at Turkish missions and at the ports of entry. Shopping and Dining: Within walking distance to the hotel there is a shopping center called Antalya Migros Shopping Center. Antalya is a famous touristic city. You can organise tours to visit historical sites from the hotel reservation desk. Antalya Museum is just next to the hotel. The Antalya Aquarium is just a close taxi ride away from the hotel. Note: Please remember to register and sign the attandence sheet for all days during the program!!! A final programme including abstracts has now been released. Flash presentations: NOTE we have simplified the flash presentations. You are presenting your own poster in form of a PechaKucha presentation. You have only 2 min in total - each slide should run exactly (timed!) for 20 sec. Very quickly I made an instruction video how to get a timed powerpoint presentation (the video quality is possibly not the highest but should do the job). We received more accommodation requests than expected and some of you will be booked into the Eryl Mor - a small hotel directly by the Bangor Pier. You will receive an e-mail if you are booked into Eryl Mor! The training school “Synthesis for nano- and glyco-sciences” is planned to be held at Bangor University and will be an excellent opportunity for PhD students/postdocs to pick the brains from the more established researchers and to exchange knowledge between other ESRs. The event will be jointly sponsored by the COST Action MultiGlycoNano CM1102 and the IBCarb. The meeting covers various aspects of current carbohydrate chemistry with a special emphasis on multivalent glycoconjugates. We have an excellent group of speakers primarily from the 'younger generation' of carbohydrate chemists. We are very pleased to present both the Dextra Carbohydrate Chemistry Award and the Buchanan Award (prize for the best ESR talk) during the event. Deadline for applications: 13. March 2015 (abstracts/accommodation) - event registration 27. March 2015 - The registration for new participants is now closed! To register for this meeting please follow this link: Registration. This will open a page in Eventbrite. Registration for the training school is free of charge. However, travel, subsistance and accommodation has to be covered by the attendees. To make life easier we offer a training school package (invited speakers first choice, ESRs select this if you want us to sort out your accommodation) and a meal ticket (if you prefer to book your own accommodation). The training school package covers both the costs and reservation for your accommodation and the meal ticket. We can offer ca 30 bursaries for ESRs (maximum funding for non-UK ESRs is €780, ca £565). Please note that bursaries will be paid out after the meeting, thus you need to put in your money up-front to pay for travel, accommodation, food. ESRs please select either the training school package or the meal ticket. Invited speakers and core management members will be reimbursed according to the COST scheme (please select the training school package). Please indicate in your registration that you are interested in a bursary by using the 'contact the organiser' on the Eventbrite registration page. This will generate an e-mail to us. Only meal tickets can be purchased - please book your own accommodation if you have not done so! Plenary lectures: Jeroen Codee, NL; Claire Eyers, UK; Carmen Galan, UK. Keynote lectures: Martin Fascione, UK; ; Mustafa Guler, TR; Vladimir Kren, CZ; Cristina Nativi, I; Christina Schäffer, AU; Trinidad Velasco-Torrijos, IE; Industrial Speaker, Carbosynth. The Management centre will be the first choice (invited speakers, management board but there is space for more) but there are many good B&Bs in Bangor. If you book your accommodation via the training school package, you will be automatically booked into the Management centre. 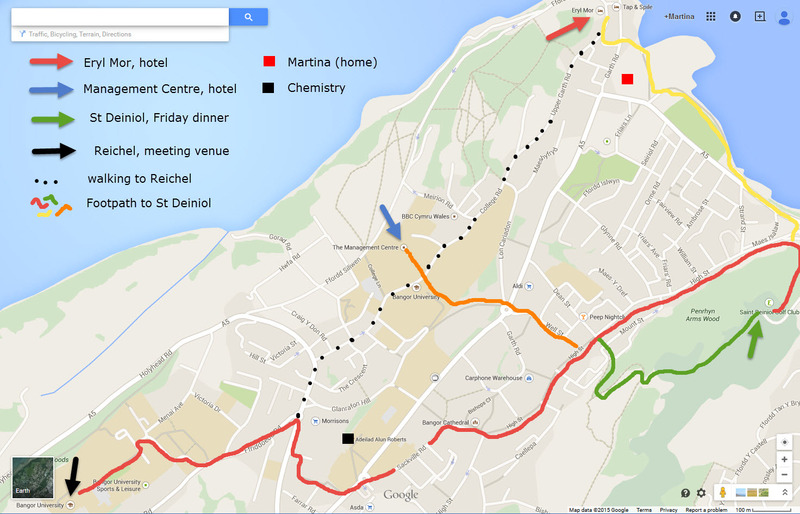 We received more accommodation requests than expected and some of you will be booked into the Eryl Mor - a small hotel directly by the Bangor Pier. You will receive an e-mail if you are booked into Eryl Mor! Here are some places for hotels. If you google for B&B places, make sure your location is really in Bangor and not in the surroundings. TRAIN: The train station is right by the university and connects to Holyhead, Birmingham, Manchester, Liverpool, London and Cardiff. In the UK it makes sense to buy a return ticket. It costs roughly the same as a single. There are special cheaper tickets. However, if you miss a train with such a ticket you will have to buy a new one at the train. Please stick to your train tickets. There is often a control after you have left the train. Delays are not uncommon in the UK. A journey planner (you can also buy tickets from this link) is found here. FLIGHTS/AIRPORTS: Some cheaper companies fly to Liverpool - John Lennon airport. From there you can take either a taxi, a transfer bus or a local bus to Liverpool. Another option is to fly to London Heathrow. The train connection London-Euston/Bangor is very good (ca 3 h) but it takes about 80 min to come to Heathrow from Euston (and you need your Oyster card ready, otherwise the tube is getting pricey). Birmingham is possible and there are direct trains f/t Birminham and Birminham has a rail station. Manchester is possibly the best option for the majority. 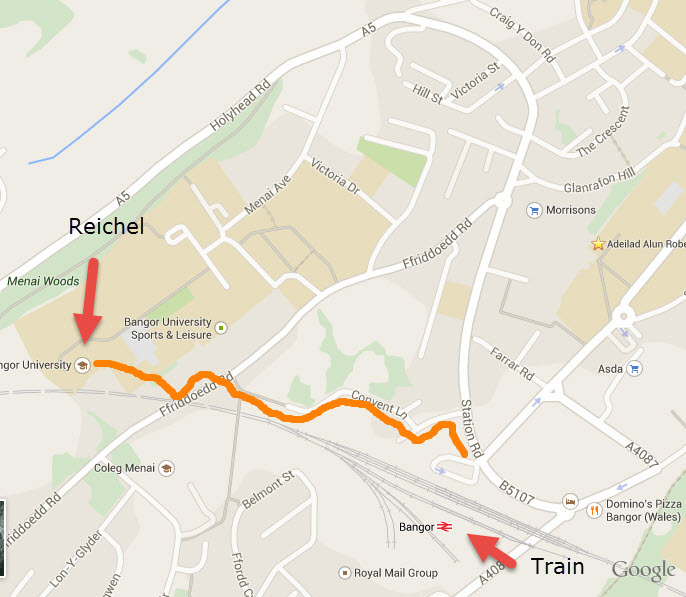 There is a rail station at the airport (Manchester Airport, MIA in the journey planner, BNG for Bangor). From there connections are going either via Crewe (change), then Chester (sometimes you have to change) to Bangor. Other connections go via Manchester Picadilly or Oxford Street. If your connection gives you only 5 min in Oxford Street, this can be a bit short but works if it is the same platform. The open return ticket is currently £50.50. In principle all places can be reached by foot but Bangor is a bit hilly and some good footpathes are not so easy to find. 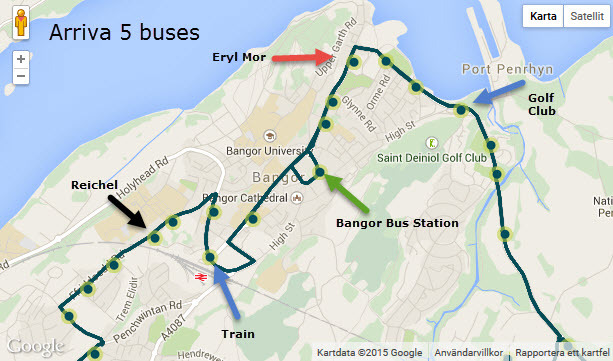 Unfortunately, the buses in Bangor change the names of their stops every now and then. The map is correct but if you check the timetable you will find different names than what is used on the buses. I relate the important stops to names that are in use and also found in the timetable. The rest you will need to figure out yourself. Reichel is 2 stops after Morrison. It is one stop from the train station to Morrison. All buses meet at Bangor Bus Station. The correct bus stop for Eryl Môr is 2 stops before Nelson. The golf club is 1 stop after Nelson. Use the journey planner for details (there are many more buses). Since the distances are so close you can always use Bangor Nelson and Bangor Morrison. A day return ticket is £5.50. A weekly ticket (7 days) is 17.50. Obviously there isn't very much time. Nevertheless, if you have a chance to come a day earlier or stay throughout the weekend, there are many opportunities to have a look around. The castles in the area are quite impressive and worthwhile a visit (Beaumaris, Conwy, Caernarfon are around the corner). The Bangor pier is quite nice to walk along if the weather is fine. The Snowdon (and Snowdonia) are not the alps but quite rocky mountains or hills if you come from the alps. Depending on the weather you can have very good views - maybe even spot Ireland in the distance. We will have our dinner at St Deiniol golf club (don't expect anything posh, it is a very relaxed pub-style, local club). I am absolutely hoping for good weather because from up there you can see both the top of the Snowdon and the open sea. In case you are interested in a round of golf just tell me. The secretary offered for COST/IBCarb participants a special rate (we have both left- and right- handed clubs you can borrow, buggies/trolleys for hire) for tee times on Thursday morning or Saturday afternoon - be warned the course is quite hilly but offers a stunning scenery. Last but not least, there are a number of good micro breweries in the are. One worth a visit is in Porthmadog. This meeting is called a training school, thus we want to do a bit more than just running a normal conference schedule. Therefore, we want to give you, the ESR, the opportunity to share some of your knowledge too. We will have 35 places for posters. The scientific committee will select up to 20 poster abstracts for a brief communication. One of these speakers will have the chance to win the Buchanan Award. In addition we will select up to 10 abstracts for flash presentations. We are able to offer some bursaries (ca 30). Please use the e-mail link (Eventbrite) to indicate that you are interested in a bursary. All bursaries have been allocated to ESR students. You should have received information about it via e-mail by now. There will be two relatively short poster sessions at this meeting, one on Friday over lunch and a second just before the end of the meeting. However, all posters will be hanging on the boards throughout the meeting. Please stick to max A0, portrait. Why are we only doing short poster sessions? Isn't this just a waste of time? Not at all - read on. At most conferences, the poster sessions are very crowdy, and at least I find it very difficult to read something that is hanging high up on a wall. During this meeting hopefully every poster will be presented either via a brief communication or by a flash presentations. The brief communications will be presented by the ESR who submitted the abstract and will have a 5 min slot allocated. The flash presentations: NOTE we have simplified the flash presentations. You are presenting your own poster in form of a PechaKucha presentation. You have only 2 min - each slide should run exactly (timed!) for 20 sec. The annual COST meeting was hosted by Cristina Nativi at Certosa di Pontignano (Siena) 25-28 June 2014. The event commenced immediately after the carbohydrate chemistry meeting (CSCC, 22-25 June) with speakers from Italy and other European countries. A highlight of the COST meeting was the presentation (technology transfer) by Prof. Hiroaki Suga (University of Tokyo). The meeting was free to attend for all COST CM1102 and SCI members. The registration deadline was the 21.March 2014. There was a Special event (opens new webpage) in the afternoon of the 25th of June (pdf-file of the programme). In case you are coming by car please follow this link. The best way to reach Siena (and then Pontignano) is by bus. The bus leaves Pisa Airport (timetable) and arrives in Siena by passing Florence. The bus stop at Pisa Airport is right next to the arrivals, at your right when you exit the airport. You can buy tickets at the airport, online (http://www.airportbusexpress.it) or onboard on Ryanair flights. 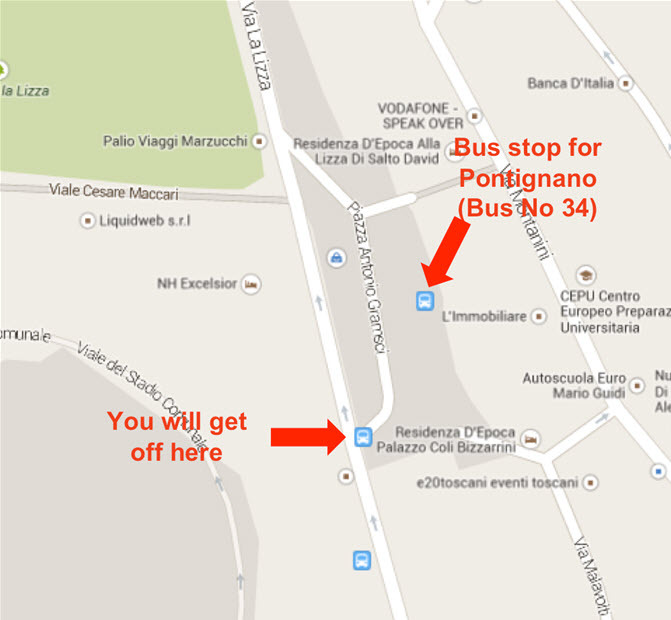 When you arrive in Siena follow the directions in section No 3 below. 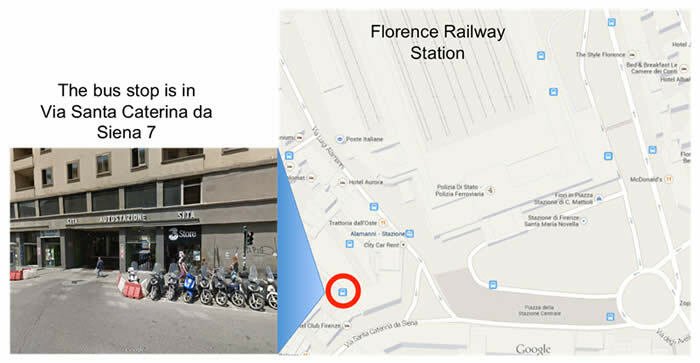 Coming from Florence Airport you need to go first to 'Florence Railway Station'. To do so you can take the shuttle bus from the airport. Below you will find the timetable. At the railway station you have to take the bus for Siena. The bus stop is indicated in the map below and is very close to the station. Another option is to go from the airport in Florence to the bus stop for Siena (Autostazione Sita, via Santa Caterina da Siena 7) by taxi. Below the taxi fares. In Siena, the bus arrive at the Piazza Gramsci. 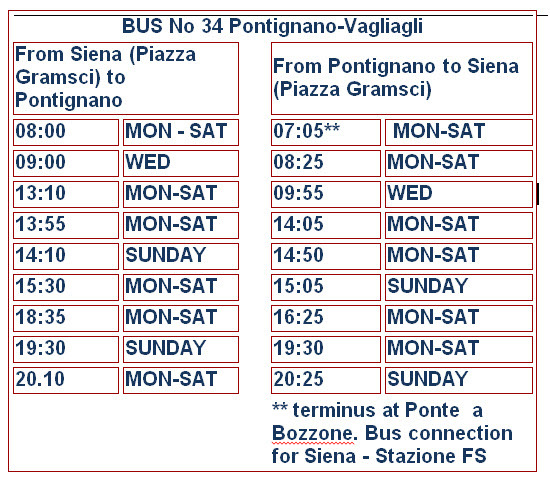 In the same square, take bus No 34 for Pontignano (see map and timetable below). The Spring Training School “Dynamic nano- and glyco-sciences” is an excellent opportunity for 25 PhD students/postdocs and sponsored by the COST Action MultiGlycoNano CM1102. The event is hosted by Stéphane Vincent and organised jointly with the “Dynano” ITN network. 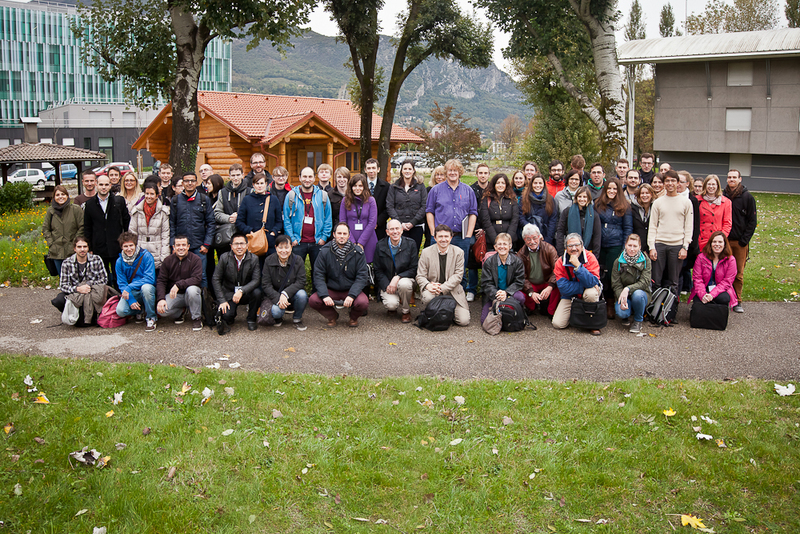 In November 2013, the Winter Training School "Structural Glycosciences" gave 46 (20 were planned) young scientists the opportunity to enhance their knowledge on various techniques that have been developed to characterise the 3D structures of glycans, glycoconjugates and protein-glycoconjugate complexes. This integrative and multidisciplinary workshop will cover current methods for analysing kinetics and thermodynamics of glycoconjugate-protein interactions. The registration was limited to 20 people because of the limitations in space at the facilities to be visited (ILL - neutron diffraction, ESRF - synchrotron beam lines, IBS - surface plasmon resonance) but in the end 46 scientists were accepted. A preliminary programme can be found here. Details about the application process and eligibility can be found on the Exchange and Training page. A brief report about the event can be read here. The official group photo is available here. And here are pictures taken during the workshops. The third COST event was running as a satellite meeting of the 10th Carbohydrate Bioengineering Meeting in Prague, Czech Republic (21-24 April 2013). Lectures and the poster session covered important aspects of glycoconjugates and glyconanomaterials. Photos taken during the workshop can be found here. The second COST meeting was a joint meeting with the UK Royal Society of Chemistry Carbohydrate Group at the University of Birmingham 26-28 September 2012 (organisers Dr John Fossey and Dr Bruce Turnbull). The main part of the conference run from lunchtime on Wednesday 26 until lunchtime Friday 28 September. The meeting included an Early Stage Researcher (ESR) networking event including asession with flash presentations from all participating ESRs, and featured the 2012 Haworth Memorial Lecture delivered by Prof David Bundle (University of Alberta) and invited talks from members of COST CM1102 and the RSC Carbohydrate Group. During the networking event participants were divided into 5 groups. Each group was asked to produce a very short video themed around MultiGlycoNano and COST. Here are the results. Please keep in mind that these videos were produced with given material during a workshop session (ca. 30 min). Group 5 (Multivalent glycoconjugates as inhibitors of HIV). Read here the Scientific Report by Bruce Turnbull, Chair. The document also includes the Meeting schedule and also the list of the flash presentations given by the Early Stage Researchers. The first meeting of our COST action CM1102 “MultiGlycoNano” took place 2-4 February 2012 at the Department of Chemistry and Biochemistry, University of Berne, Switzerland....Read here the Scientific Report by Jean-Louis Reymond, Vice-Chair.